Provide comfort for the family of Alice Stanton with a meaningful gesture of sympathy. Marie was born in West Plains, MO on Nov. 22, 1925 to Emery “Ming” Washington and Narcissus Ann (Brown) Rader. In 1927, she moved to Odessa, MO at the age of two in a covered wagon with her family from West Plains. Marie married Roy Stanton on April 17, 1950 in Kansas City, MO. Roy and Marie moved to Spring Hill in 1953. Marie was a homemaker, as she and Roy raised four children: Gail, Dale, Toni, and Rex. Marie was a member of the Morning Grange and Family Life Organization. She was an avid reader and enjoyed working on puzzles. Marie loved her family and will be missed by family and friends. Marie was preceded in death by her parents, granddaughter Amanda, and siblings: Harold, Lloyd, Dorothy and Opal. She is survived by her husband Roy of the home, sons: Gail (Calayne ), Spring Hill, KS, Dale, Spring Hill, KS, and Rex, Kalispell, MT, daughter Toni Stanton-Walton of Spring Hill, KS, 11 grandchildren, 13 great-grandchildren and one great-great-granddaughter. 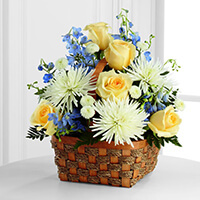 Bonnie, Larry, and Nancy Blackwell sent flowers to the family of Alice Marie Stanton (Rader). Bonnie, Larry, and Nancy Blackwell purchased the The FTD Heavenly Scented Basket for the family of Alice Stanton.